Have you had a STAR moment? When presenters want to captivate their audience, a STAR moment can be the difference between “OK” and “WOW”! Presentation design expert Nancy Duarte coined the term STAR moment in her book Resonate (2010), in which STAR stands for Something They’ll Always Remember. It describes a special moment in a presentation when the presenter magnifies the main idea; it’s the “Ah Ha” or “WOW” moment. She recommends having a STAR moment in all your presentations. I agree with her, however designing and delivering that special moment can be a challenge. It will likely take some thinking to decide the best way to deliver your STAR moment. It could be as simple as showing a black slide, then stepping up to your audience and telling your special story, OR asking a key question that says it all, OR it could be a dramatic visual that fills the screen. In Resonate, Nancy Duarte describes five types of STAR moments: memorable dramatizations, repeatable sound bites, evocative visuals, emotive storytelling and shocking statistics. There are excellent examples of STAR moments on the internet. Steve Jobs’s product presentations are good examples (available on www.YouTube.com, search under Steve Jobs). Another place to find examples is the TED website (www.ted.com). TED has over 900 video recordings of presentations. One of my favorites is Jamie Oliver’s Teach Every Child about Food presentation, in which he dumps a wheel barrow of sugar on the stage http://www.ted.com/talks/lang/eng/jamie_oliver.html . His presentation is worth watching. Traditional bullet-point presentations don’t normally have STAR moments, they move along at a low hum. Try to include a STAR moment in your next presentation, using whichever style is most appropriate. It should be unexpected, and fit your audience and topic. 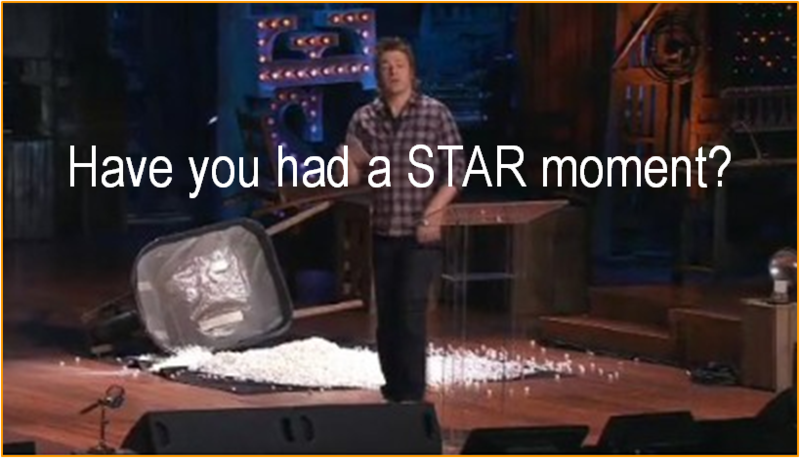 I try to include STAR moments in my presentations. Some have worked better than others, but each one is an experience. Have you had a STAR moment? Are you willing to share it? Thanks for the mention in your post! Thanks Fred for the great example of a STAR moment and a BIG closing. 3 – 30 – 3 Make your words easy to see!